A wildly popular Indiegogo campaign is offering early birds the world's smallest Linux server, with Wi-Fi built in for IoT applications, for $5. Boston-based Onion Corp. began its Indiegogo crowdfunding campaign in July and by Aug. 23 had already received more than $773,400 in pledged funding -- 4,400 times its funding goal. 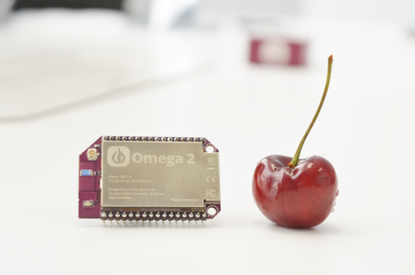 The Onion Corp. said its new Omega2 computer is compatible with a power-sipping Arduino motherboard but it also has the flexibility of a Raspberry Pi computer. A view of the front and back of the Omega2 computer. The $5 computer, expected to ship in December to early-bird buyers, comes two iterations: A base Omega2 model comes with 64MB of RAM and 16MB of flash storage; a $9 "Plus" model has 128MB RAM and 32MB storage, along with a MicroSD slot for additional storage capacity. Both computers use a 580MHz CPU. The computer can also be expanded to support cellular and Bluebooth, and GPS connections. The company's original Omega computer retailed for $19 and had a 400MHz CPU. A dock needed to connect the computer to power and storage starts at $20. A starter kit that includes the computer, expansion dock, micro-USB cable, keypad and an LED screen and several other parts can be had for $75. An expansion dock for the Omega2 computer. "We want to lower the barrier of entry, and allow everyone to take the leap into hardware development," the company stated on its Indiegogo campaign site. The company said that the computer is fully functional out of the box and is no different than using a desktop computer. There's no need for Wi-Fi dongles or to install an OS image onto an external SD card. Onion displayed several projects created using the Omega2, from something as simple as wall art with LEDs controlled by the computer and an Airplay music streaming device, to a wirelessly controlled robot. "We've built simple and intuitive apps for you to interact with the Omega2. We also have an App Store where you can discover even more apps," the company said. Early-bird prices do not include shipping fees.